Below is a summary of information on knife/sheath materials, processes and ordering/purchasing information. If you have any questions, please feel free to reach me on my contact page. I forge my blades out of high carbon steels such as 1080/84/95, W1-2, 5160, 52100, 15N20, Cru-forge V and my own Damascus steels, depending on the knife's purpose or your preference. My damascus steel is also forged from the same steels listed above. This means my damascus is a "working" steel, not just a "cool to look at", decorative material. Most of my blades are flat ground with a convex (apple seed) edge, though some of my larger camp knives and such are also convex grinds... again, purpose and preference. My Scandi-Bushcraft knives are flat ground to a zero edge as tradition requires as well as some of my top clips on Bowie/Fighters. Sole authorship is very important to me which is why I do everything "in house" (with the exception of leather sheaths/scrimshaw/engraving). From designing and heat treating to making my own damascus, I do it right here on the mountain. 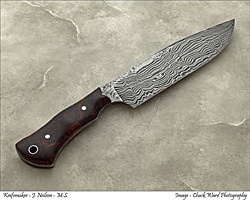 As to the "in shop" heat treating of my blades, I prefer to edge or clay quench high carbon steels whereas most damascus blades are fully quenched, unless an edge quench is requested. Scandi-Bushcraft knives are, of course, fully quenched. All blades are put through multiple thermal, hardening and tempering cycles. Since all of my high carbon steel blades are heat treated here, I can guarantee each knife has an extremely tough and durable edge (58-59 Rc). When completed, there are a variety of final finishes available for your completed blade. I can put a simple satin finish or a fine hand-rubbed finish on my high carbon steel blades. I can also acid etch some steels/blades to bring out the hamon or quench line as well as a deep etch and polish on damascus blades. I also offer my "antiqued" finish which has become a very popular concept from Cowboy shooters (for it's "aged/period" look) to our modern Military and Police personnel for it's non-reflective abilities, low maintanence and resistance to the elements for high carbon blades. Your choice for your needs. Upon finishing, all blades are sharpened and polished to a fine "toothy" edge so your edge will "bite" and then slice through whatever your working with or through. This gives you a very tough, durable and attractive working knife whether it goes into the field or into your collection. Handle material and hardware are, for the most part, a matter of personal preference and come in an almost endless variety. For handles, I prefer to use a lot of natural materials including Sambar stag, bone, ivory and horn, plus a variety of stabilized burls and exotic woods like Desert Ironwood, Amboyna, Redwood, Maple, and other burls, Cocobola, African Blackwood, etc. All are kiln dried for stability and sealed for durability before being buffed to a high finish. Synthetic materials also play a part in my handles. These include Micarta, G-10, Kirinite, etc. These can be used as accents or as an entire piece. There are also more than a few choices for your knife's hardware (guards, pommels, pins, etc.) including brass, nickel-silver, bronze, copper, wrought iron, etched, lightly blued or "antiqued" carbon steel as well as stainless steel. Many of my materials are obtained from James Poplin and Tracy Mickley who are great folks and always willing to answer questions about materials/supplies. I have sheaths made from vegetable tanned cowhide for almost all of my projects. The vegetable tanning process creates a durable, somewhat rigid leather that will accept carvings, tooling and dyes. 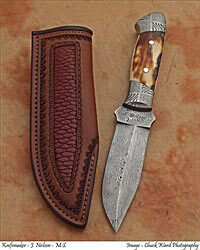 Many of my sheaths are done by Mark Condos of Texas and Jose Trevino of Arizona. These are, in my opinion, a couple of the best traditional sheath makers out there. They specialize in traditional pouch, sash and blade sheaths. All sheaths are tooled and stitched by hand and treated with a protective leather finish. Among the many options that make each project unique are posts, exotic inlays, tooling/texturing/carvings and dye color. The vegetable tanning process is much less corrosive to the steel than chrome-tanning, but long term storage of knives in any sheath is not recommended. All of my knves that come with a leather sheath, also come with a padded & zippered storage case for that purpose. I've also been working with John Cohea of Mississippi for quite some time who is a master of the period/frontier style sheath. I've been doing more and more of the period/frontier style knife and John has been matching the sheath to each piece with accents of raw-hide, trade beads, fringe, teeth/claws, etc. I also offer a variety of Kydex sheaths on many of my knives (such as my "Basic Utility Series" and multiple Neck Knives) for those who want a smaller or lighter sheath... or just a different look on a Neilson knife. "I guarantee all the items I make for quality workmanship and performance. If you are not completely satisfied, you can return any item for replacement or a full refund." I accept check/money order, credit card & Paypal. Personal checks will need to clear before a purchase is shipped. On personalized orders (items with engraved, scrimshawed, etched initials, names or other personalized work), no payment is due until an item is completed and you have received several photos via e-mail of the finished product for your approval. Then payment would be required before the "personalization" is done, as it would them make the item un-saleable to anyone else. Deposits- There is a 10% deposit on orders of $1,000.00 or more. All knives/sheaths are shipped after payment is received via USPS insured priority shipping and are priced at USPS flat rates. *US residents of Pennsylvania please add appropriate sales tax. Note: Over time, changes in humidity may cause slight variations to occur in natural handle materials. Knives are meant to be used as cutting instruments, not as screwdrivers or pry bars. Any such abuse will void the warranty. A custom knife will perform admirably for many, many years if given the same care as any good tool or gun. I'm hoping that they will last much longer than me and be handed down to your grandchildren and theirs. All knives are shipped with a coating of oil to protect them during shipping. - My classes are for 1-2 people, not large groups, so you will get personal, one-on-one instruction from me and all materials are provided. - I do not have set class dates. Contact me to discuss the type of class you'd like and to schedule a date that will fit both of our calenders, as well as a list of hotels close by. - Classes are from 9am to 4pm and are 1-2 days. Most folks don't stop for lunch but, if you'd like, your welcome to bring a lunch or snacks and water is provided. -There will be a $50.00 deposit (non-refundable) per person when the class is scheduled and all students are required to sign a waiver of liability before class starts. "Basic Bladesmithing" (1 day class) - In this class we will forge a basic high carbon steel blade/blades. We will cover different blade designs, types of steels, forging techniques as well as thermal cycling/hardening/tempering and grinding a blade. Cost: $600.00/per person. "Basic Hunters" (2 day class) - This class will cover forging a full tang Hunter (just like my Basic Bladesmithing class) but, you will also learn how to plan, prepare, set and finish your handle and sharpen with a belt. Cost: $1,200.00/per person. "Advanced Hunters... Hidden Tang with Stag" (2 day class) - My Advanced Hunter class will also cover the forging of a Hunter blade but, in a hidden tang style. This class will focus on my methods of making a strong and safe hidden tang knife and knocking down a lot of the "myth" about hidden tangs. I will show how to set a guard on your knife and my method for "pinning" your knife to a stag crown handle. Cost: $1,400.00/per person. "Basic Forge Welding/Damascus Making" (1 day class) - This class will cover the basics of forge welding steel. We will cover the different methods to forge weld steel including san mai, laminate and canister damascus as well as how to forge a blade from these materials. Cost: $800.00/per person.